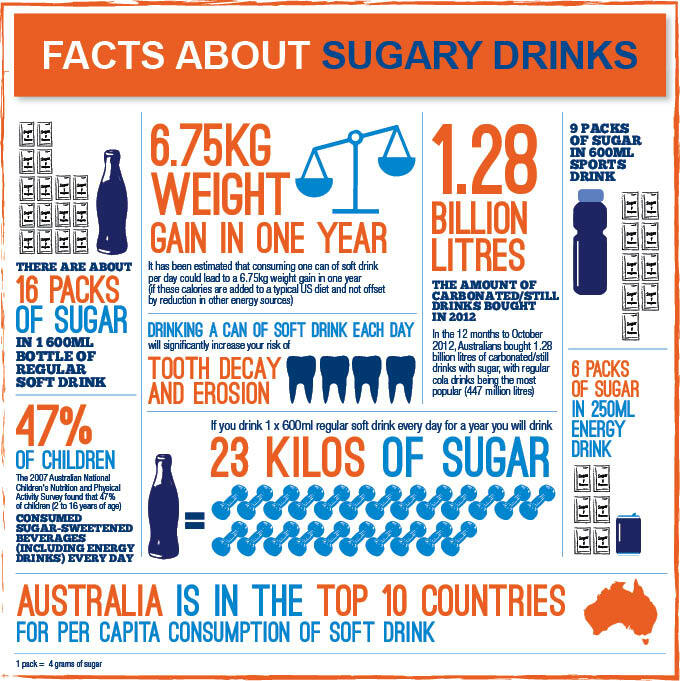 The consumption of sugary drinks in Australia is becoming quite a concern nation wide. Roughly half of all males had consumed a soft drink the day before the recent Australian Bureau of Statistics survey was taken. Cumberland Dental supports the Rethink Sugary Drink campaign. Sugary drinks have high levels of acid which dissolve tooth structure; the instant sugar hit also has an effect on insulin levels and the pancreas. Your teeth will be at higher risk of decay and your are more likely to put on weight overall. It is clearly time for Australians to think about what they are drinking. It is really easy for young people with no history of decay to come into our clinic and need 6 or more fillings. Rethink that Sugary Drink. For more information head to the ADAVB website.